BALTIMORE (CNS) — During their annual fall general assembly in Baltimore Nov. 12-15, the U.S. bishops voted down a document on the troubled U.S. economy, passed documents on penance and better preaching, approved a reorganization of their Communications Department and endorsed the sainthood cause of Dorothy Day. The bishops were to meet in executive session Nov. 14 and 15, which were not open to the media. On the assembly’s opening day, the bishops discussed on the nation’s troubled economy and what their response to it should be, but a day later their proposed document “The Hope of the Gospel in Difficult Times: A Pastoral Message on Work, Poverty and the Economy” did not gain the two-thirds vote required for passage. When it was introduced Nov. 12, some bishops criticized the document for being too long to be practical and for failing to include a variety of points and historical references. On the assembly’s second day, the bishops approved their first new document in 30 years on preaching. The document, “Preaching the Mystery of Faith: The Sunday Homily,” encourages preachers to connect the Sunday homily with people’s daily lives. The document was prepared by the U.S. Conference of Catholic Bishops’ Committee on Clergy, Consecrated Life and Vocations, chaired by Archbishop Robert J. Carlson of St. Louis. The bishops also overwhelmingly approved — in a 236-1 vote –an exhortation encouraging Catholics to take advantage of the sacrament of penance, or reconciliation. The text was prepared by the bishops’ Committee on Evangelization and Catechesis, chaired by Bishop David L. Ricken of Green Bay, Wis. The exhortation, to be made available in pamphlet form, will aim to ease the fears of Catholics who have not gone to confession for some time. It will be made public in time to allow for dioceses to prepare for Lent 2013. 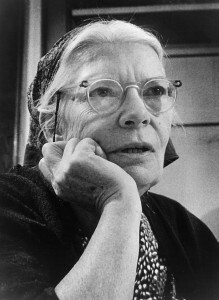 On a voice vote, the bishops endorsed the sainthood cause of Dorothy Day, co-founder of the Catholic Worker movement. New York Cardinal Timothy M. Dolan, USCCB president, is promoting Day’s cause; her Catholic Worker ministry was based in New York City. The cause was first undertaken by one of Cardinal Dolan’s predecessors in New York, Cardinal John O’Connor. Cardinal Dolan and other bishops who spoke Nov. 13, including some who had met Day, called her sainthood cause an opportune moment in the life of the U.S. church. The bishops also approved expanding the memorial for Blessed Francis Xavier Seelos, a German-born Redemptorist priest who ministered throughout antebellum-era America for more than 20 years. Archbishop Thomas J. Rodi of Mobile, Ala., noted that Blessed Seelos ministered at a time when “immigrants were not welcomed well in many circumstances,” which he said has contemporary significance. A year after U.S. Catholics began using a new translation of the missal at Masses, the bishops agreed to begin revising the Liturgy of the Hours — updating hymns, psalms, various canticles, psalm prayers, some antiphons, biblical readings and other components of the liturgical prayers used at various parts of the day. Archbishop Gregory M. Aymond of New Orleans, chairman of the Committee on Divine Worship, said the work would probably take three to five years to complete and the aim would be to more accurately reflect the original Latin texts. The bishops approved a reorganization of their Communications Department that would include hiring a director of public affairs who would work to unify messages on the activities and stances of the USCCB — not individual dioceses or bishops — and better carry out church campaigns related to new evangelization, according to Cardinal Dolan. 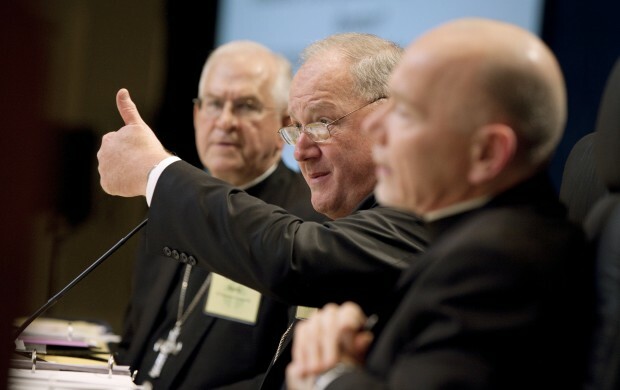 Cardinal Dolan said the USCCB’s communications effort must take advantage of new communications technologies. The cost of hiring a public affairs director and support staff and other services is estimated at $400,000 annually, according to the supporting document. The plan calls for a reorganization of the Communications Department, which includes a media relations office, customer and client relations, creative services, which is responsible for online and video messages, and Catholic News Service. The bishops were also urged to broaden their support for their national collections. In a Nov. 13 report, they heard that a decline in diocesan participation in these collections since 2009 has been a loss of $8.7 million to Catholic programs that benefit from the collection. The bishops were initially scheduled to consider a document titled “Contemporary Challenges and Opportunities for the Exercise of the Teaching Ministry of the Diocesan Bishop,” developed by the Committee on Doctrine. The document urged bishops to take advantage of new technologies — social media, blogging and cell phone technology — to respond and explain church teaching when it is portrayed inaccurately, particularly by theologians. Cardinal Donald W. Wuerl of Washington, committee chairman, decided to withdraw the document in favor of a more comprehensive statement in line with the bishops’ new communication plan and the ongoing work throughout the USCCB related to the new evangelization. The bishops Nov. 12 agreed in a voice vote to the appointment of a working group — made up of the committee chairmen for doctrine, evangelization and catechesis, and canonical affairs and church governance — to draft the document. The bishops voted for a strategic plan that will guide the USCCB’s work for the next four years, a “road map” to shape conference programs and activities to strengthen the faith of Catholics and help them actively live out their faith. During the first year, the focus will be on faith and activities closely tied to the Year of Faith. In 2014 and 2015, initiatives will strengthen parish life and worship. The final year calls for Catholics to be witnesses to the wider world. The bishops also approved a 2013 budget of $220.4 million and agreed to add a national collection for the U.S. Archdiocese for the Military Services. The budget for 2013 represents a 1.3 percent increase from 2012. The new collection for the military archdiocese would begin in 2013. Under the plan, it would be taken voluntarily in parishes every three years. Bishop Michael J. Bransfield of Wheeling-Charleston, W.Va., USCCB treasurer, said the 2013 budget includes a surplus totaling more than $749,000. He also told the bishops that there was a projected surplus of $250,000 for 2014, meaning there was no need to seek an increase in the annual diocesan assessment for USCCB operations. In his presidential address to open the assembly, Cardinal Dolan Nov. 12 told the bishops they cannot engage culture, dialogue with others or confront challenges unless they first recognize their own sins and experience the grace of repentance. The cardinal also said the sacrament of penance was something the USCCB planned to stress for all Catholics year-round with reflections on re-embracing Friday as a day of penance, including the possible reinstitution of abstinence on all Fridays. The bishops’ assembly, which opened nearly a week after Election Day, included discussions about religious liberty, marriage and immigration. During a news conference just after the statement was released, several bishops underscored their support for immigration reform. The bishops’ assembly, which opened nearly a week after Election Day, also included discussions about religious liberty and marriage. Contributing to this report were Mark Pattison, Patricia Zapor and Dennis Sadowski in Baltimore and Carol Zimmermann in Washington.